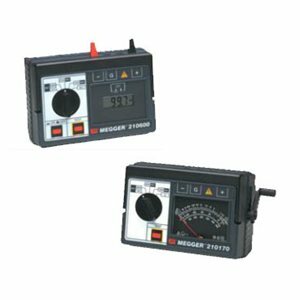 These Insulation Resistance Testers are the ideal instruments when high ranges are needed for measuring insulation resistance. Both provide excellent test voltage regulation and an external guard terminal to eliminate surface leakage current from the measurement. The instruments are all electronic; they generate a regulated dc high voltage and use low-zero-drift, high-accuracy circuits, with high current sensitivity. Designed for portability, each is enclosed in a molded, impact-resistance, flame-retardant case.